Here are a few photos of some of my own models, with accompanying notes. Built from the Golden Age kit, but modified to CO2 power. The model was pretty much as per the kit, with the main modification being the addition of a 1/16" ply bulkhead for the Gasparin GM 120 motor. The front nose block was hollowed out to fit around the front of the motor, and made removable to allow adjustments and motor lubrication. The lower nose block, including the radiator, was also modified so it could be removed to allow access to the back of the engine mounting bolts. The filler nozzle for the motor protrudes through the wing centre section - not very elegant, but functional! Some extra structure was added to the fuselage - new diagonals on the sides, and some sheeting in the region of the undercarriage. I added hinged trim tabs to the fin and elevator to allow some fine tuning of the flight pattern. 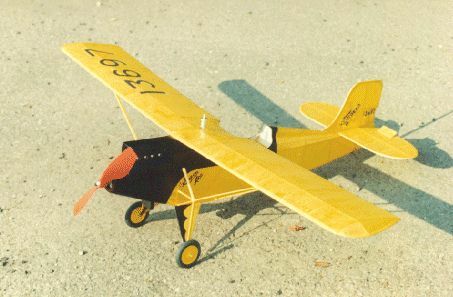 A sprung undercarriage was made by mounting the wheels on a conventional wire landing gear, bound and glued to the fuselage, but not in any way connected to the balsa landing gear struts. The wires are practically invisible, as they sit inboard of the balsa struts. This has proved very successful, and is something I use now wherever possible on vintage scale designs (I cannot claim this idea as my own - I copied it from a Walt Mooney peanut scale model plan). Model is covered with yellow Japanese tissue, with the black areas painted using black dope. The areas were outlined first with thin black tissue stripes (the shapes being traced from the plan), and the dope simply brush painted up to these edges. The Corben and Super Ace decals were home made using the artwork on the plan and a photocopier. Wing numbers were cut out from black tissue and doped in position. Total model weight (with motor) is 45g. It flies very well - stable and predictable. the Gasparin CO2 motor is a little gem, and the model cruises round for a minute or so quite happily on a normal charge. Since writing the above, the model has been retired after a good few year's service (one repair too many) and all the useful bits stored for recycling. The Motor may well find its way into a Pfalz D.111a - we'll have to wait and see. Another Golden Age kit, this time converted to electric power. As with the Corben, not too many alterations to the kit plan were made. Again, a ply bulkhead was added to mount the Knight and Pridham KP-01 electric motor. As the aircraft has a fairly long nose, the battery pack was mounted as far back as the wires would allow - in this case in the radiator housing. Originally the model only had two cells, as supplied with the motor when I first got it (it has been in two other models before this one!) but this proved underpowered, and now three cells have been installed. A wire wing saddle was incorporated into the centre section wing struts to add strength. Nylon fishing line was used for the rigging, and this adds a lot of strength to the wing mount (especially as the wires are doubled). A sprung undercarriage as per the Corben was added, and the fin modified so that it was in two halves. This allowed the lower half to be attached to the fuselage, the tailplane added, then the upper half glued on. Finish is coloured Japanese tissue, as supplied, and the kit decals were used. The crew are from Small Scale Services (vac-form, very light) - the gunner has his head cut off and glued back on at an angle, to add a bit of variety - also gave him a moustache! This is another model that has now gone to that great scrapyard in the sky - it fell off the top of a tall bookcase (no wheel chocks!) Still, it gives me room to store another one. The original aircraft had the distinction of holding the world speed record of 755.14 Km/hr from 1939 until 1966, when it was finally broken by a Grumman Bearcat. The span is only 20", but it has a bulky, if well-streamlined fuselage, and weighs in at 56g without rubber (13g of this is the prop!). Covering is blue Japanese tissue, airbrushed with a thin coat of dark blue enamel thinned with cellulose thinners (helps the paint adhere to the doped tissue better). Lettering is also masked and airbrushed. Control surface outlines are thin strips of black decal. 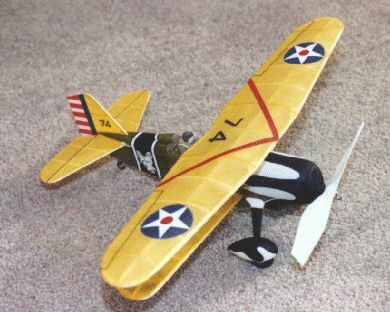 The cockpit is stretch formed over a balsa mould, the wheels are from laminated light balsa with aluminium tube bushes, and the propeller has a balsa spinner and blades from two Peck plastic props. In the years since I built this model, I have had several attempts to get it to fly, and only this year (2001) have I had what I would call a successful, stable flight where it looks vaguely like the pilot is in some sort of control! Earlier attempts have resulted in several broken props, and a damaged undercarriage. The three-blade prop is very vulnerable in a fast arrival, and this plane tends to arrive at ground level quite rapidly! Early stalling tendencies seem to have been cured now. Power is currently one loop of 1/4" rubber, and it lands with some turns still on. Dare I increase the power and make it go even faster?! Flight pattern is usually pretty straight to start off with, with a high speed gradual climb, then a gentle left turn before the landing. I reckon it has only managed to stay up for about 20 seconds, but it somehow seems longer when it is in the air! This model was built from the pre-war Comet plan, with just one or two alterations. 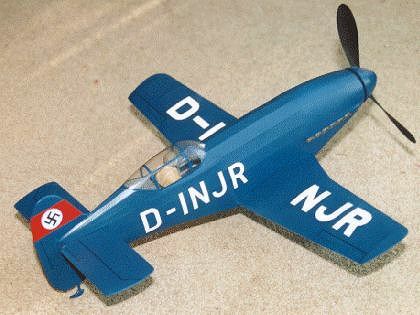 The basic design is first class, and looks pretty accurate, capturing the charactor of this colourful little aircraft. I enlarged the tailplane slightly (106% linear on a photocopier), and made it a one-piece affair, fitting into a slot in the rear fuselage. The undercarriage wire joining the wheel pants to the fuselage is not attached to the undercarriage legs - this gives it some spring to reduce shock loads on landing. All wing struts are balsa, but I reinforced the attachment points of the centre section struts, and used nylon fishing line for rigging. I made a decent sized removable noseblock, and fitted a cut-down Tern prop. Somewhat to my surprise, this model flew "straight off the board" after a bit of tailplane shimming, and seems to be very stable. It flies in left hand circuits as if on rails, and the main limit on performance seems to be the relatively short fuselage, limiting the length of rubber that can be used. Up to now, indoor flights of around 30 seconds using 1000 winds have been achieved using two loops of .075" rubber. 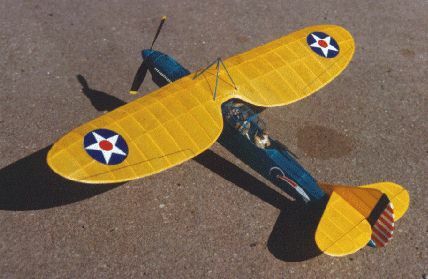 With a bit more rubber, the model was flown outdoor at the Nexus scale weekend at Old Warden (June 1999). Two loops of 0.085" rubber gave a good rate of climb, and a best time of 38 seconds was obtained.